Well, actually, experimentalisms and musical fusions are becoming extremely normal on Metal bands. It's a way to become an unique band in the middle of this great musical tsunami we see on last times. Besides there are complainers that are getting heavy on our nerves (especially in Brazil, with this fashion called "old school Metal", creating Dolly clones that think they are the real thing in terms of Metal), it's a very good thing, a breath of fresh air that blows the mold and dust away. 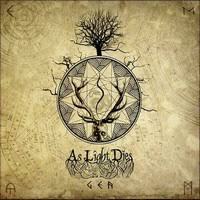 And Spain, a land of very good bands, shows its face again with AS LIGHT DIES, that releases their new EP, "Gea". To be honest and straight, their musical work can be described as a fusion of Doom Death Metal/Doom Gothic (I do not believe in the so called label Gothic Metal, but I use it only as a reference for you, dear readers) bands like MY DYING BRIDE, PARADISE LOST, and THEATRE OF TRAGEDY in their most elegant, introspective and extreme times with a musical technique that gets near of something DREAM THEATER did on "Images and Words" times (when they were more interested in creating good songs than individual technical exhibitions). So we can say that it's a heavy, beautiful and technical form of music, but with good taste. And it's not boring to our ears. The sound quality is very good. We can really understand what they are playing clearly, as it is heavy as their music needs in some times. It's has the both aspect in a very good equilibrium state, so there is no complains about this aspect. Don't ask me why, but this quality reminds me a lot from the first works from MY DYING BRIDE, specially on "Turn Loose the Swans" era. This EP has four songs: two good instrumentals ("Terra" and "Gaia"), showing a very good technical work from the instruments. But when "Gea" is played, we can hear and have the clear idea of what they are into: a fusion of an elegant and grandiose form of music, with introspective and harsh moments coexisting, all flowing in the middle of good keyboards and vocal duties, and a very good technical rhythmic session. But don't let the guitars aside, for in the clean or harsh moments, they are very good. And the EP ends with a very fine version for ENSLAVED's "As Fire Swept Clean The Earth", respecting the original, but inputting their own personality, with a very good use of harsh voices along with clean and tender ones. And it has the presence of two very good guests on Daniel Maqueda on keyboards and Jose Yuste on bass guitar. Well, hear it and take your own conclusions, but it's a very good EP.